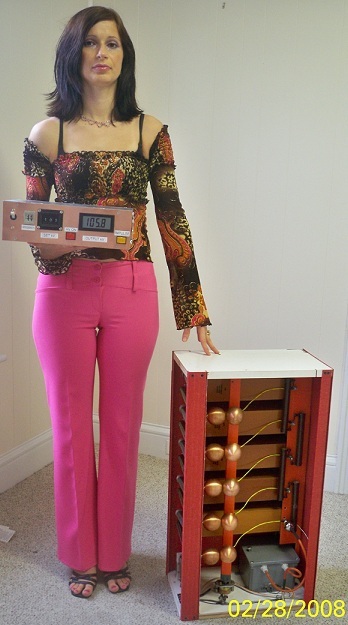 High Voltage Instrument has been a manufacturer of quality high voltage test equipment for over 40 years. We are located in Danbury, Ct. with a sales and repair service facility in Budapest, Hungary. 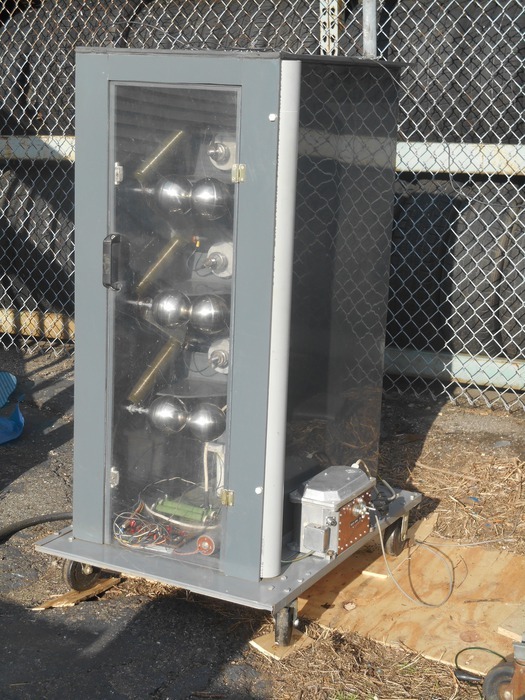 Impulse generator is lightning strike simulator capable of producing a waveform, which conforms to industry standards. Rise time is 1.5 microseconds, the tail time is 50 microseconds long. The unit is constructed with plug-in type resistors for ease of waveform changing. 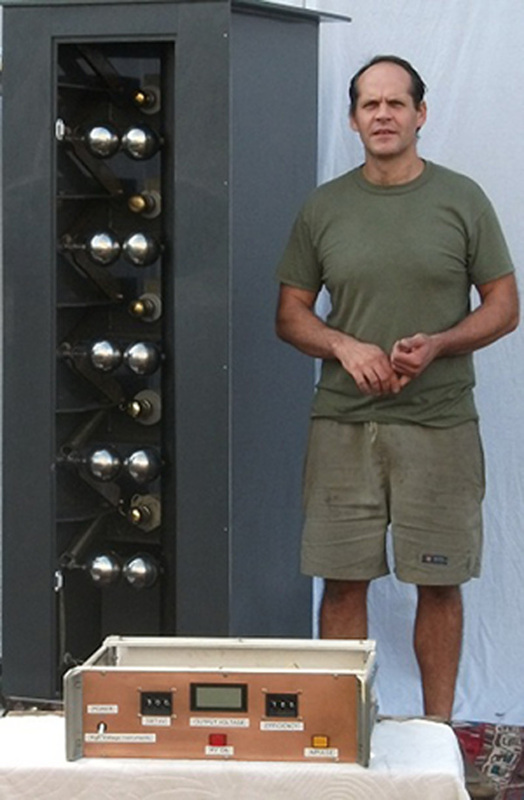 Portable Impulse Generators for lightload 200 kV 500 kV. The BIL tester is designed for testing medium voltage switch gears, circuit breakers, bushings, bus network. It is easy to use, can be operated by anyone. Lightning strike [1.2/50 usec] output 5 - 10 stages, 0,1 uF/40 kV. 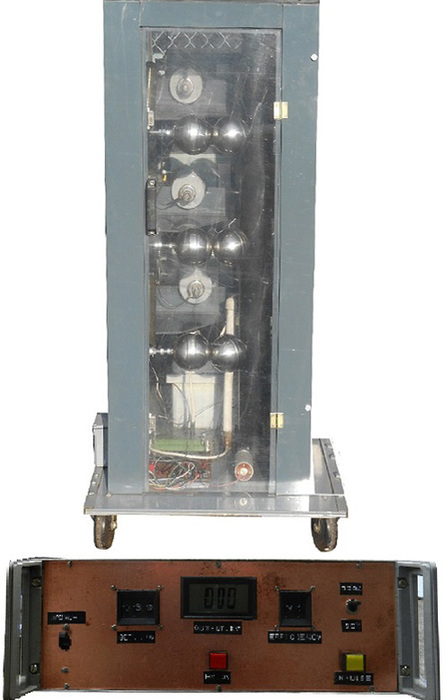 Capacitors +/- 40 kV manually reversible power supply. Front - and tail resistors set for 1.2/ usec waveform. Very compact design! Just dial the requested Impulse voltage, switch HV ON and press IMPULSE button. Built - in capacitive voltage divider [critically damped] preload. Input power: 120 V, 60 Hz max 3 A.
OWON battery operated digital color scope. 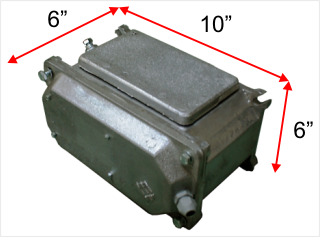 The BIL is in full accordance with the ANSI C37.20.2-1999 Standard, Section 5.2.3 Voltage withstand levels for metal-enclosed interrupter switchgear. Higher energy easy to transport Impulse Generators on wheels. 200 - 300 kV 6 kJ complete impulse generator. Compact design on wheels. Welded PVC Structure. Optional computer interface. In order to make a given value impulse, the operator only has to dial the requested Output voltage, and press HV ON and IMPULSE button. Wave forming resistors, Voltage divider, Preload capacitor, Smart Digital controller. Main Supply: 115 V, 20 Amps Standard outlet. 500 kV 2 kJ complete generator. Features: Compact design on wheels. Welded PVC structure. Dust enclosure. In order to make a given value impulse, the operator only has to dial the requested output voltage, and press IMPULSE button. Capacitor Bank and Power supply: 32" W, 72" H, 46" D.
Controller: 19" W, 5" ¼ H, 12" D.
Capacitor bank, Reversible power supply, Wave forming resistors, Voltage divider / preload capacitor, Smart digital controller, OWON scope. Main supply: 115 V 20 amps Standard outlet. 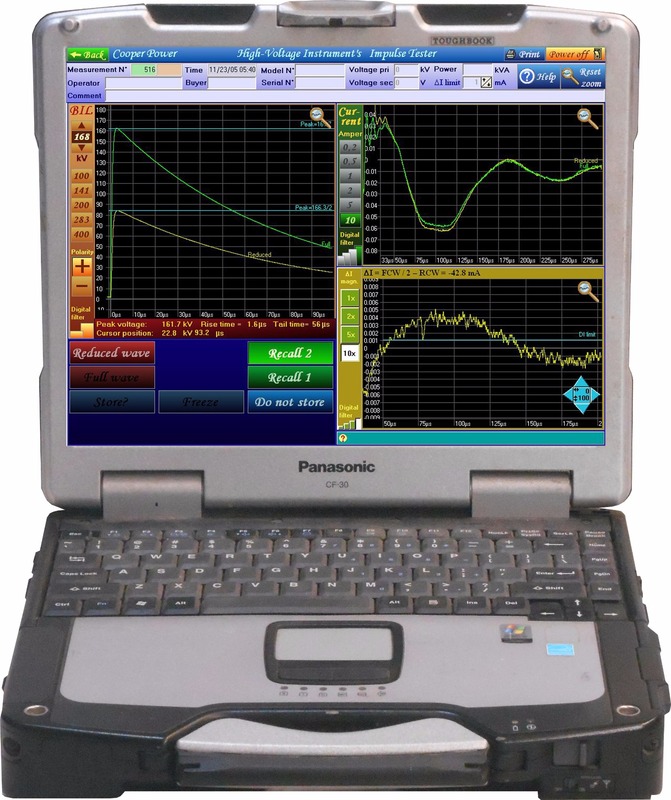 Generator is a one piece complet impulse test equipment, on wheels. 1.) Roll it over to transformer. 3.) Connect only 3 wires to transformer: voltage, return (shunt),ground. On Smart Controller. Dial BIL Set 50%, press HV ON, IMPULSE Few second later. Set 100%, press HV ON, IMPULSE. Digitizer recorded every voltage- and current waveforms. It makes decision go - no go, good or bad the transformer. 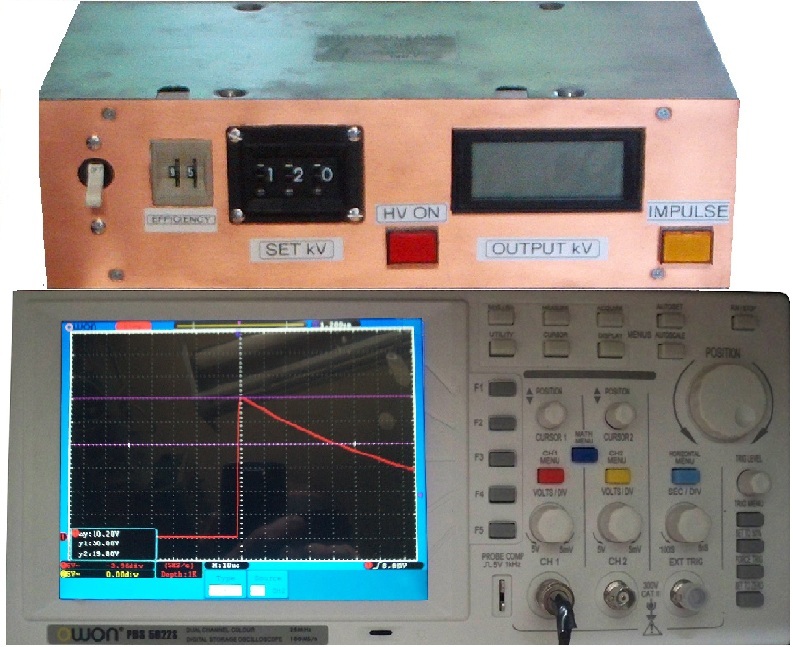 High Voltage Instrument has developed a revolutionary new high voltage impulse measuring system with fiber optic isolation. Our patented isolation system created by Dr. Aladar Kohalmi PhD. (Patent Pending No. P0402120) digitizer is built into the high voltage divider, connected to the computer by using fiber optic cable. 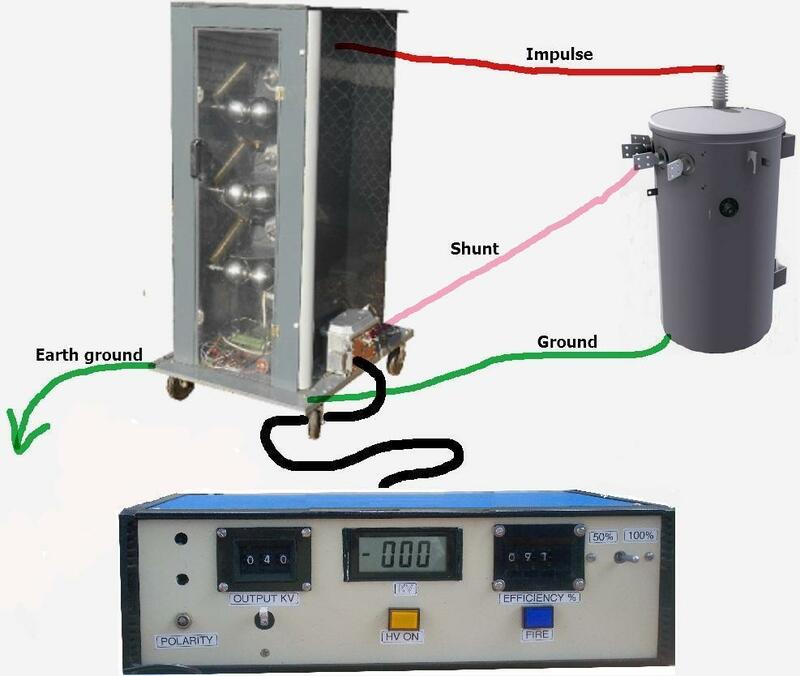 This system eliminates the galvanic connection between the high voltage ground (impulse generator), the measuring system (computer) and the operator. The old outdated digital recorders still use coaxial cables and heavy EMI/RFI enclosures. During the fast rise-time of the high voltage impulse, high current flows through the grounding wires and coaxial cable shield, causing large measurement errors. Furthermore, this high current can potentially damage the computer, and endanger the operator. In our years of experience in the field, we have seen a difference in potential greater than 50 kV between a "well" grounded generator and far earth ground. Sampling rate: 100 MS/sec for Lightning test. Including: EMP protected Panasonic Toughbook, which could work without any shield, or shielded room. Lightning and Switching surge tests. 100 MS/sec for Lightning test, 10 MS/sec for Switching surge Input range.